In her most emotionally wrenching, lyrically written book since the National Book Award finalist Speak, best-selling author Laurie Halse Anderson explores one girl's chilling descent into the all-consuming vortex of anorexia." "You’re not dead, but you’re not alive, either. You’re a wintergirl, Lia-Lia, caught in between the worlds. You’re a ghost with a beating heart"
This is my second book by this author, my first being Speak. Laurie Halse Anderson has already proved to me that she is a stunning writer after reading Speak, I couldn't wait to get my hands on this book next. In Wintergirls she pieces together one of the most haunting, painfully vivid stories that I have ever read. Wintergirls is a very visual read. Every Scar on Lia's body, every morsel of food she puts in her mouth, you can see it. It's as if you are right there beside her, a ghostly figure like Cassie, watching her. The character cast is small, which makes reading the book more personal. The book is written like a diary, Lia is speaking directly to you, telling you her story. Lia is a powerful character, she is fighting a battle with food and with her body. The less she weighs the stronger she feels in her mind, even though she is deteriorating, wearing away slowly. Elijah's character threw me off at first, but then I quickly understood that he was a very important character, and important for Lia. She needed him. There is so much I want to say about this book but I don't want to give anything away! Laurie Halse Anderson crafted such a painful, beautifully told story. Lia's character will stay with you long after you've finished reading it. I don't know why I waited so long to read Wintergirls but I'm glad I finally did. I think it is one of those books that everyone should read at least once. 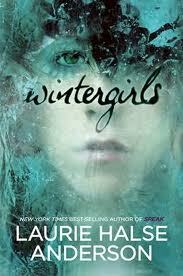 Wintergirls is one of the best YA books I have read. Amazing review! I've been wanting to read Wintergirls really bad. Glad I got to read your review, now I will definitely go out and get it.